Are you tired of searching for the fountain of youth? Well, look no more. 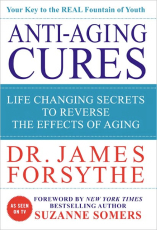 In this book, Nevada medical oncologist Dr. James Forsythe, one of the world’s leading anti-aging experts, reveals how to slow and even reverse the aging process. Based on meticulously researched clinical evidence, Anti-Aging Cures provides an account of revolutionary anti-aging treatments that can prevent the health conditions associated with getting old. The key to youth, good health, and vitality as we age comes from our body’s master hormone, human growth hormone (HGH). By rejuvenating the master hormone gland using a range of safe and natural biostimulators, as the book shows, we can improve the quality and duration of the human lifespan, prevent heart disease and obesity, and maintain optimal health as we mature. The medically documented and proven benefits include: loss of body-fat mass, improved skin texture and tone, improved bone density, improved libido and sleep quality, and much more.